Lose weight. Have a healthy life. Follow these 8 simple habits! In the modern busy and stressful life, living healthy is as hard as it is important. Obesity or excessive body weight is one of the most common problems that are faced by the modern day men and women. Men and women of today have become so busy in their compact schedules that there is very little time for them to take care of themselves. Proper work outs routines or regular exercises can take care of this over-weight problem but then again where is the time for such things? Moreover, the busy schedules have also led to some common habits among men and women that have made them to face with the problem of being overweight. 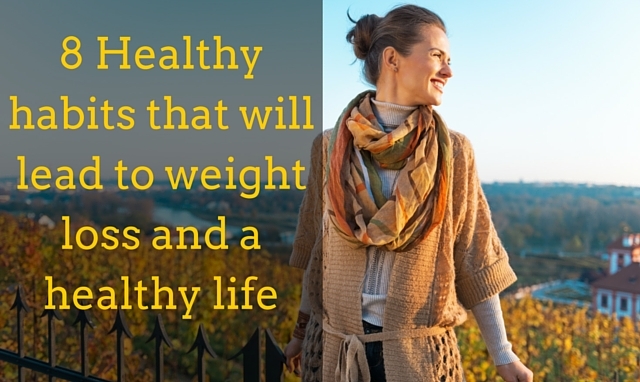 A little change in the lifestyle and acquiring of certain habits can help a great deal in successfully losing weight and leading a happy life. Eating whole food is perfect for leading a healthy life and to lose weight successfully. Food is the basic source of nourishment for the body and hence having a proper diet is very essential for healthy living. Junk foods may suit your taste buds greatly but they are harmful to the leading of a healthy and proper life. The additional preservatives, vegetable oils, processed foods and sweeteners cause gain in body weight and hence need to be strictly forbidden. In the modern rat race of life, it is very difficult to maintain the level of stress and pressure that befalls on a person. In addition, research has proved the fact that stress makes a man (and of course, a woman) fat. At the time of stress a flight reaction burdens the hormonal balance of your body along with your heart. This phenomenon raises the level of cortisol and adrenalin that stocks up energy within your body. Ultimately, a state of hunger is aroused because of the fewer amounts of calories that are burnt during the stressed out state. Hence, it is always better to avoid stress in order to lose weight. And stress is certainly not a good thing and isn’t even remotely related to healthy living. Stress can lead to headaches, strokes, heart attacks, grey hair and much more. Avoid sedentary lifestyle. Be active. Leading a life full of activity helps in maintaining of the fitness of your body. Regular exercise is one of the keys to losing weight and keeping it under control. If you are concerned with your fitness, always try to remain active and make time for some workouts even in your packed and busy schedules. Job satisfaction is an important part of leading a healthy and peaceful life. For leading a life both physically and mentally fit, you need to do a job that you are satisfied of. This is because that is something you do every day and if you are not satisfied with it then your life starts to seem miserable. In addition, happiness being a major part of a healthy life, needs to be well taken care of in every aspect. You need to keep company of people who will encourage you to stay fit and healthy all the time. This is very important because they are the people you spend most of the time of your day with and having motivating and healthy minded people around you can bring in a sense of urge within you to stay fit and healthy as well. Being with healthy minded people not only helps you but also encourages you in your effort to lose weight and stay fit. Being high on self-confidence a person can carry himself in a lot better way than the others and maintain a healthy atmosphere in and around him. Having a confident, energetic, joyous and youthful vigor in your personality will get likeminded people around you for whom fitness is a priority. Life is not all about profession and making money. There is much more to life like fitness, health, fun, friends and hobbies. Maintaining an optimistic attitude towards life is very important. You need to indulge in activities like playing, quizzing, debating and so on. Always keep yourself up to date and educate yourself. Try to learn something in every incident that happens in your life. Such a learning attitude will help eradicate unnecessary fear and hesitation to try out new things. These things help maintain a healthy atmosphere that is important in the process of losing of weight. Too much of anything is harmful but that does not mean that you will stop enjoying the small things in life. An occasional cup of ice cream, a bottle of soda, relishing a cake and enjoying a weekend watching movies can in no way be harmful. However, preventive measures also need to be taken for leading a healthy life. Going for regular checkups, keeping an eye on your weight and checking on the food habits are key to maintaining healthy life and losing the unwanted weight of your body. Keep moving while talking on a phone. These and same tiny small tips will lead to a big and extremely fast weight loss results, if consistently we follow the lifestyle healthy trends.